We regret to report that Associate Member Marcus Westerby passed away on 22 March after a short illness, just over a week before his 82nd birthday. 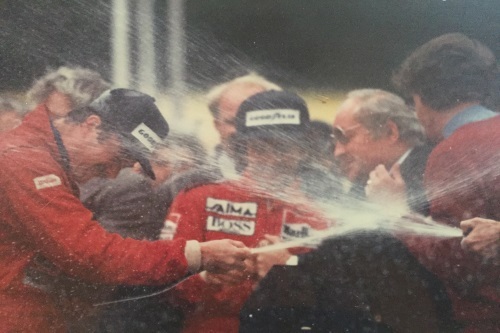 Marcus, who was elected as an Associate Member in 1991, was for many years the Sales Director of Moet et Chandon and as such is credited with introducing the champagne shower to Formula 1, beginning with the 1972 Italian Grand Prix where he succeeded in directing winner Emerson Fittipaldi’s line of fire from the podium. Marcus used to claim that the inspiration for the shower derived from the fact that the bottles which he had available had become too warm in the Italian heat, rendering the contents undrinkable. Moet et Chandon became the supplier of champagne to the majority of Formula 1 races, and other international events, which continues to this day. Marcus retired in 1994 but continued to be a regular and popular visitor to Silverstone with a fund of stories from his years of travelling the world with Formula 1. Marcus’s wife Jo passed away in 2002 and the BRDC offers its condolences to their daughters Penny, Sally and Emma and their families. The funeral will be at the Milton Chapel, Chilterns Crematorium, Whielden Lane, Amersham HP7 0ND on 8 April at 10:45am. After the service there will be a remembrance lunch at 12 noon at the Bedford Arms Hotel, Chenies House, Chenies, Rickmansworth WD3 6EQ – all Members are welcome. Please inform lisa.benamore@brdc.co.uk or 01327 850922 if you would like to attend the lunch.